Research findings prove the capabilities of silicon nanoparticles for flexible data processing in optical communication systems. Schematic representation of the system studied in the paper. Photoexcitation of a silicon nanoparticle by a femtosecond laser pulse. Intense irradiation excites electrons in the silicon nanoparticle into the conduction band, which alters the optical properties of the particle (amplitudes of electric and magnetic dipole resonance) in a way that enables unidirectional scattering of incident light. A team of physicists from ITMO University (Saint Petersburg) and Moscow Institute of Physics and Technology (MIPT) has demonstrated the potential of silicon nanoparticles for effective non-linear light manipulation. Their work lays the foundation for the development of novel optical devices with a wide range of functionalities. These silicon nanoparticles based devices would allow to transmit, reflect, or scatter incident light in a specified direction, depending on its intensity. They could be integrated into microchips that would enable ultrafast all-optical signal processing in optical communication lines and the next generation optical computers. From left to right, Alexander Krasnok, Denis Baranov, Sergey Makarov - cooperative team of young scientists from ITMO University and Moscow Institute of Physics and Technology. Electromagnetic waves of a wide spectral range are used to transmit information: from radio waves that carry radio signals over the air to infrared radiation and visible light used in telecommunications to transfer data through fibre optics. An essential component of any equipment that relies on electromagnetic waves for information transmission and processing is a device called the antenna, which is designed to either receive or transmit signals in a particular direction. It is often the case that incoming signals need to be flexibly processed. This requires the use of a reconfigurable antenna, i.e. one whose characteristics (e.g. its radiation pattern) can be changed in a specific manner during signal processing. One possible solution relies on the use of a non-linear antenna, which can be switched by the incident light itself. It is a top priority — and at the same time a major challenge — to develop such tuneable antennas operating at infrared and optical frequencies. Nowadays, we can already transmit information through fibre optics at incredible speeds of up to hundreds of Gbit/s. However, silicon-based electronics are unable to process the incoming data at that rate. Non-linear nanoantennas that work at optical wavelengths could help us to resolve this problem and make ultrafast all-optical signal processing possible. To demonstrate non-linear switching, the authors of the paper, which was published in ACS Photonics, have studied a dielectric nanoantenna — an optically resonant spherical nanoparticle made of silicon. While spherical particles of all sizes show resonances, it is the size of the particle that determines its resonant wavelength. The first of these resonances, which can be observed at the longest wavelength, is the magnetic dipole resonance. Incident light of a certain wavelength induces a circular electric current in the particle, similar to the current that flows in a closed circuit. Because silicon has a high refractive index, particles with diameters approaching 100 nm will already show the magnetic dipole resonance at optical frequencies, making them useful for enhancing various optical effects at the nanoscale. The team has used silicon nanosphere resonances to enhance Raman scattering in an earlier study, which is detailed in another article. The optical properties of a non-linear silicon nanoantenna are manipulated by means of electron plasma generation. As silicon is a semiconductor, there are almost no electrons in its conduction band under normal conditions. However, exposing it to a laser pulse of high intensity and very short duration (≈100 femtoseconds, i.e. about 10⁻¹³ or one ten-trillionth of a second) excites the electrons into the conduction band. This significantly alters the properties of the material as well as the behaviour of the silicon nanoantenna itself, causing it to scatter light in the direction of the incident pulse. Thus, by exposing a particle to a short and intense pulse, its behaviour as an antenna can be dynamically controlled. In order to demonstrate ultrafast nanoantenna switching, the authors of the study carried out a series of experiments, which involved the irradiation of an array of silicon nanoparticles with a short and intense laser pulse and a continuous measurement of their transmittance. 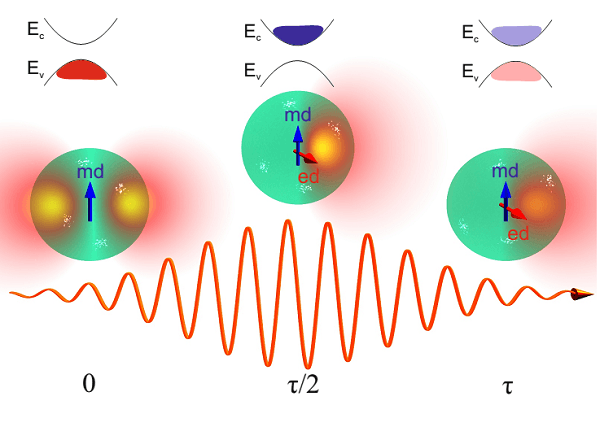 The researchers observed that the transmission coefficient of a structure changed by several per cent within 100 femtoseconds and then gradually returned to its initial value. On the basis of the experimental results, the researchers went on to develop an analytical model that describes the ultrafast non-linear dynamics of the nanoantenna examined in the study, as well as the generation and relaxation of electron plasma in silicon. According to the model, a radical change in the scattering diagram of the antenna occurs within a very short period of time — on the order of 100 femtoseconds. Before the pulse arrival, the amount of energy scattered by the particle in the forward direction is nearly the same as in the backward direction. However, driven by a short pulse, the antenna switches to almost perfectly unidirectional forward-scattering. Theoretical predictions backed by the experimental data suggest that an antenna of this kind would have a bandwidth of about 250 Gbit/s, whereas conventional silicon-based electronics rely on components with bandwidths limited to only tens of Gbit/s. The experiments performed by the authors of the study have demonstrated ultrafast nanoantenna switching between different light scattering modes, which is caused by the interaction of an intense laser pulse with the silicon of the nanostructure. The researchers have developed an analytical theory describing the behaviour of such non-linear nanoantennas. The research shows that silicon nanoparticles might well become the basis for developing ultrafast optical nanodevices. Our model can be used to design nanostructures containing silicon particles that are more complex, which would enable us to manipulate light in a most unusual way. For example, we hope to eventually control not just the amplitude of an optical signal but also its direction. We expect to be able to “turn” it by a specified angle on an ultrafast timescale. Sergey Makarov, senior researcher at the Department (Chair) of Nanophotonics and Metamaterials, ITMO University.